Simple story. Two 40-something Quebec natives who have been living in Toronto separately return to their northern hometown of Ile D’Or. In the mining town they meet former friends and remnants of families. They talk a lot, try a few tentative flings, eventually leave. Complex story. Emotionally. Especially as they hook up romantically with two others of their generation who never left town. All four have pasts — ghosts of dead ex-lovers, marriages on the rocks, family mysteries, and professional doubts — which twist together during the visit. 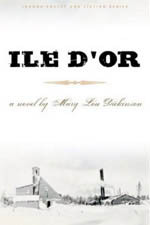 The most important character though may be Ile D’Or itself, a grasping town built on the greed for gold, on a rough-hewn individualist morality, and on the division between the English and French. Our protagonists were born in the hard-scrabble 1930s, raised into the narrow-minded 1950s and are returning to their roots in 1980, shortly after the first Quebec referendum, which rejected the separatist option. In many ways Ile D’Or is a far different world now from the one they grew up in, but many of the problems that drove away the young people remain and now in approaching middle age they have to face them. Toronto writer May Lou Dickinson, herself a former Quebec northerner, somehow keeps all these emotional, social and political threads straight to weave an involving story of ordinary people figuring each other out. There’s something very Canadian in the content with its characters’ experiences in snow-driven cabins, with horses stuck in swamps, and on frozen lakes — the northern survival theme should please our literary theorists. But the unadorned, earnest style is also very much of this country’s past. The writing is quite direct and accomplished, especially given that this is the first novel for the 70-something author. Perhaps it’s a little old-fashioned — but old-fashioned in the way readers like, telling a complicated story simply and effectively. And every now and then Dickinson’s characters throw in an explicit but honest sexual reference (to throw off anyone who’s dwelling too much on the author’s age). If I have any disappointment with the novel, it’s that the story doesn’t come to any great climax. Certain revelations are made. Some relationships are resolved. Conclusions are reached. But life goes on in the town and the protagonists continue to muddle through their messy lives. But that too may be very Canadian. Nothing overly dramatic, nothing bigger than life. Our modest lives as they are. Lucky us, to have author Scott Carter among us. The Beach-bred and Riverdale-dwelling teacher and screenwriter has produced his first novel, Blind Luck, and it’s a terrific read. Not a particularly heavy read though, despite the narrative hinging on a horrifying tragic incident. That event, coming early in the novel, caught me off-guard despite my having been warned of it by another reader, such is the appeal of Carter’s jaunty writing style. On a day like any other, accountant Dave Bolden who has spent his life avoiding risk is suddenly cast as the sole survivor of an freak accident that wipes out his colleagues and friends. The quirk of fate that kept him safe (he was in the washroom) leads him understandably to experience a severe case of survivor guilt. But it also leads others to consider him inherently lucky. Among them are a wealthy entrepreneur who aims to add to his millions by marketing Dave’s good luck. He starts by backing guesses Dave makes on sports games and the stock market but ends up coercing him into criminal and bloody “extreme betting” situations. Meanwhile Dave also hooks up with a notoriously unlucky young woman in hopes that his luck will rub off on her. But it doesn’t seem to work that way, at least not at first. Throughout all this he refuses to believe in luck, despite mounting evidence to the contrary. This is the part of the novel that belies credibility. Firstly, it’s bizarre that his wildest guesses about bank account figures, about the mauling targets of, about strangers’ names keep coming true — that’s not luck, it’s miracles. And secondly, it’s beyond belief that these repeated incredible results don’t affect his opinion of his own abilities. Complicating his thinking is his aged father, an inveterate and impoverished gambler Dave is keeping in a care facility. His dad doesn’t believe in a person being naturally lucky or unlucky either: he just figures a person should take risks in order to sometimes be fortunate. You can’t win without a ticket, as they say. But in the end it’s resolved that … well, I don’t know what is resolved. You can take the concluding events — pulling together all plot threads and presented all very excitingly — as either confirming or refuting the personal luck thesis. It’s life-affirming in a general kind of take-a-chance-on-life way. Sounds very high concept, doesn’t it? Throughout I was thinking what an interesting movie this would make, perhaps starring Nicholas Cage as the guilt-ridden ordinary man pushed by unusual circumstances into discovering his own extraordinary talents — and dealing with dangerous friends and opponents along the way. Great flicks are often made from slight books. 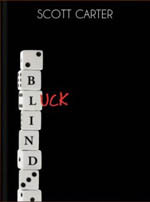 **Blind Luck,** the novel, doesn’t go much deeper into the issues raised about personal fate or fortune than such a movie treatment would. Which is too bad because Carter’s intelligent way with words suggests he could bring enlightening reflection on serious matters to a popular audience. But Blind Luck is an engaging, if tallish, tale as it is.